But, really, in this cold snowy month, you have to make those heavy, delicious dishes that are simply too heavy the rest of the year. This dish goes very well with a 20 Powder Run Day. Also a rough red wine, a salad, and a light dessert. Every Italian Momma has a recipe, but the basics are constant: it starts with meat (beef, pork, veal, duck, even boar) and vegetables like carrots, tomatoes and onions, all cooked in wine and broth. Any many aromatic herbs. When you think of it, its quite like a Jewish Brisket, except the meats are chopped up first in a Ragù. Like a brisket, it needs time to cook slowly, its not a quickie pasta supper. 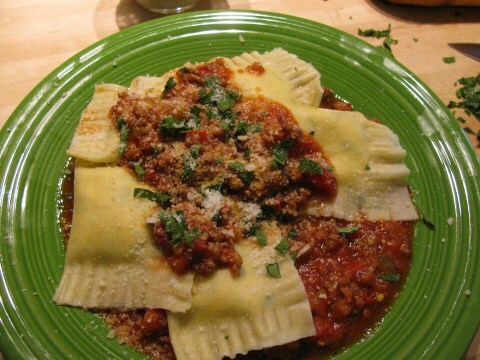 Ragù is most often served over pasta. This recipe includes dried porcini mushrooms, which give the sauce a real taste of the Tuscan countryside. 1 pound pasta, fresh pappardelle, or orichette, something that will catch and absorb the sauce. Slice or chunk sausages, removing any casings. Add lamb sauté until brown, about 5 minutes. If you feel there is a lot of grease in the pan, pour some off or dump the contents into a strainer in the sink, and drain. Return to the pan. Add onion, carrot, 1/4 cup parsley and garlic. Sauté until vegetables are tender but not brown, about 5 minutes. Add wine. Increase heat to high and boil until wine is almost evaporated, about 5 minutes. Add 1 cup chicken broth; boil 10 minutes, stirring occasionally. Add reserved mushroom liquid. Simmer until liquid is almost absorbed, about 5 minutes. Mix in tomatoes with juices, bay leaves, sage, fennel seeds and porcini mushrooms. Reduce heat to low. Simmer uncovered until sauce thickens, breaking up tomatoes with fork, adding remaining chicken broth 1/2 cup at a time and stirring occasionally, about 1 hour. Correct seasoning with salt and pepper. Cook pasta in large pot of boiling salted water until tender but still firm to bite, stirring occasionally. Drain. Add sauce to pasta pot and rewarm over medium heat. Add pasta and toss to combine. Transfer to bowl.